For the last fourteen or so years Paul Steely White has led that revolution as executive director of the company. He says New York’s seen a 30 percent reduction in casualties on the streets in the past four years. “That’s because we are designing for cycling and walking and that’s because we are saying no to the NIMBYS (not-in-my-backyard) who want to preserve the car dominance status quo,” he told Radio New Zealand earlier this year. Paul Steely White leading by example. 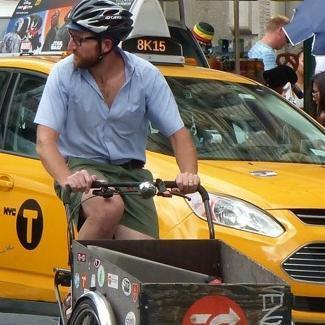 On Monday (November 12, 2018) one of the last jobs Steely White will do for Transportation Alternatives is a skype presentation to the Trafinz conference in Wellington, when he’ll discuss New York’s success with its Vision Zero policy. Vision Zero is a multi-national road traffic safety project that aims to achieve a highway system with no fatalities or serious injuries involving road traffic. It started in Sweden in October 1997, beginning with a goal of zero road deaths and taking driver error into account. New York adopted the policy in 2014, becoming the first major US city to do so. Others have since followed but without the same success in reducing casualties - in fact some have seen their casualty rate rise. In his presentation Steely White will explain why mayoral leadership is the first step towards effective Vision Zero, and detail four other factors he believes have been critical to New York’s positive result. Cyclng on Brooklyn Bridge, NYC. Photo credit - NYC & Company, Joe Buglewicz. He told Radio New Zealand that Vision Zero isn’t a war on cars. “We’re not saying we’re going to ban cars. It’s saying we now have the tools to make traffic casualties a thing of the past. Make our streets more forgiving so that when people do make errors - and people will make errors: drivers, pedestrians, cyclists - they’re less likely to be fatal. He believes millenials don’t want to own cars. “They want mobility as a service, they want a panoply of options to get around,” he told Radio New Zealand. “The notion that cities should not just be for accommodating cars, people live here dammit and we should be able to walk and cycle and really experience streets as public spaces." Steely White’s next job - which he begins hours after his skype presentation - is with electric scooter rental company, Bird, where he’ll be director of safety policy and advocacy. E-scooters are technically illegal in New York state at present. Lime Scooters in Auckland. E-Scooters are technically illegal in New York. That speed has been defined at 32 kph for pedal-assist bikes, and around 24 kph for e-scooters.